President Obama and President Raúl Castro of Cuba shake hands at the Summit of the Americas on April 11, 2015. There are too few moments in our new century when we can say without much doubt that we have achieved a historic change of trajectory and have hope at last to move from mutual confrontation towards mutual dialogue and even cooperation. 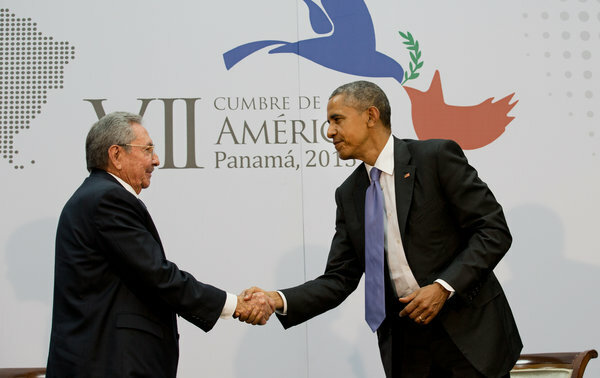 The decision of President Obama to open that dialogue, to start the process of establishing diplomatic relations, likely taking Cuba off of the list of “terrorist states”, and not least the one-on-one meeting between President Raul Castro and President Barack Obama at the Summit of the Americas in Panama. Opening the front page of the Sunday New York Times and seeing Obama and Castro sitting side by side and another shaking hands, for someone who remembers well and vividly the period of the Cuban Missile crisis, living through the long history of mutual isolation and mistrust and even conflict, gave a sense of a kind of new dawning from a dark period that neither side should be proud of. Obama’s act has also transformed our relations not only with Cuba but also Latin America; who have restored largely their own relations and criticized America for lagging in doing what was clearly wise in reaching out for some measure of starting what will be a long process of rapprochement and hopefully a more democratic Cuba in time. President Obama said that clearly “there will still be problems to overcome, but he was optimistic that we will continue to make progress and that this can indeed be a turning point.” Castro also made jesters that indicated this was a path he was willing to go down. However, he most likely hopes to obtain more than what is possible now, as hard bargaining lies ahead. There were a few moments of regressive behavior by some of the Cuban delegation at the Panama conference. This behavior indicated that in the Cuban government, those who wish to show the authoritarian side of the regime and are still clearly not accustomed to the rules and ways of public discourse and democratic dissent still exist. But, I think that was a sign of the last gasps of a weak and regressive and failing regime that is the past and not the future. There is still a long road to full rapprochement, full diplomatic relations and setting the guidelines for this new relationship. Not least, is the continued authoritarian rule in Cuba on one side, and the opposition by the anti-Castro groups and far right types here in America on the other. There will be many difficulties in this process but I think with time, and some acknowledgment by both sides that a “new day” is better than the “old animosities,” Cuba will find its own democratic footing. With this, America will leave behind its old and unsuccessful strategy of isolating Cuba and itself and gain by the new openness. If we can talk with Putin, and can talk to China, and talk with Iran, we can talk with Cuba. In my earlier days, America wisely decided by both Republican and Democratic presidents that we could and should talk to a hostile and aggressive Soviet Union and achieve thereby significant cuts in nuclear weapons via treaties, establish a “hot line,” to avoid misunderstandings, deal with a variety of arms control agreements, have military to military contacts, and conduct cultural exchanges. Thus, we certainly can find ways of cooperating with a nation just 90 miles south, where the people also seek reconciliation. Our efforts at negotiations paid off for both sides in the end. There was no real “hot war” and frankly the West prevailed via its diplomacy and wise policies; and nations were freed from the control of a failed dictatorship. President Obama, in these last two years of his presidency, without the restrictions of narrow politics, seems to act on his best values and instincts, helping shape a world if at all possible towards a more “soft landing” and enhanced security. Although it could mean disturbing our “Know Nothing” far right war hawk Republicans, he is taking chances to shape a safer and more prosperous and perhaps fairer world.